It was an incident that almost brought Greece and Turkey to war in a dispute over who owned the two uninhabited rocky islets of Imia, and cost the lives of three crew members of a Greek Navy helicopter who died during a mission, but Greece hasn’t forgotten. The crisis of Jan. 31, 1996 had international leaders scrambling to urge the two sides not to come to blows over what was derided as a pile of rocks, but which Greece said were “Greek rocks,” and refused to back down as Turkey raised the issue of national sovereignty, reminding Greeks of the unlawful 1974 invasion of Cyprus by the Turks. On Dec. 29, 1995, Turkey said the islets were Turkish territory, registered in the prefecture of Bodrum. That dispute arose when the Turkish cargo ship Figen Akat ran ashore on the islets and had to be salvaged. It turned out that maps of the area were showing conflicting attributions of the islets to either Greece and Turkey. This resulted in a conflict between the Turkish captain and the Greek authorities over who was responsible for the salvage operation. The official response of Greece came on Jan. 9, 1996. The then-Greek Foreign Minister, Theodoros Pangalos, sent a reply to Turkey claiming an indisputable Greek sovereignty over the islets. This was followed by the mayor of the Greek island Kalymnos and a priest hoisting a Greek flag on the islets on Jan. 26, escalating the tension. It wasn’t the Turkish military or officials, but Turkish TV journalists, abandoning any sense of objectivity, who flew to the islet in a helicopter and raised a Turkish flag a few days later. Within 24 hours, on Jan.30, Greek forces changed the flag again. The crisis heightened as Greek, Turkish and NATO forces sailed to the islets. On Jan. 31, at dawn, the Greek Navy helicopter flying over Imia said that that Turkish troops had landed on the islets. The helicopter crashed under mysterious circumstances, which was blamed on bad weather but which critics insist was a mutual cover-up to hide that it was shot down by Turkish fire, as the two countries were accused of concealing what really happened to prevent war. The crew members, Christodoulos Karathanasis, Panagiotis Vlahakos, and Ektoras Gialopsos, are revered as heroes by many Greeks, particularly the neo-Nazi ultra-patriotic Golden Dawn party. After intense pressure from the U.S., Greek and Turkish government removed their military forces from Imia. The territorial issue has remained unresolved since then. Imia and other islets in the Aegean are considered as “grey zones” of undetermined sovereignty by Turkey. The Greek Police issued a statement on Friday that it would restrict rallies planned to take place in Athens on Saturday to mark the Imia crisis. Rallies that are due to begin at the Imia monument at Rigillis Square, at Syntagma Square and in front of Athens University will not be allowed to develop into marches, the statement said. The statement made no reference to any of the organizers but the authorities’ chief cause of concern is believed to be the possibility of clashes between supporters of the neofascist Golden Dawn and members of leftist groups. Short video announcing Golden Dawns annual Imia commemoration march! Photo of Golden Dawns Imia commemorative march held in February last year. This years march looks like it will be even bigger! Imia and the loss of pride, and the people with the loss of their savings in the Greek stock market were the cause of the traitor Simitis and all who followed him. You little fickers can do nothing in greece. 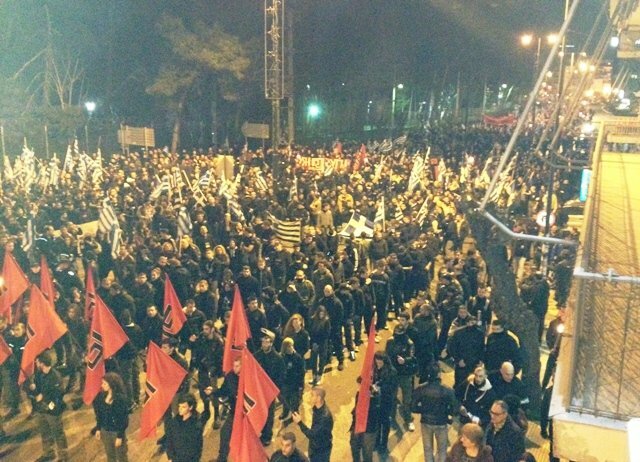 golden dawn cannot take over greece, they are to weak. Greece claims nothing, the island is Greek. It is Turkey that continues to claim – with silly arguments for a State – islands such as Imia, Kalymnos and even Lesbos. Turks arrived in our region 500 years ago, Anatolia and the Aegean belongs to Greece which has been for over 2000 years, Turks need to go back to where they came from and that is ‘Turkmenistan’. Eventually the isles of Imia will end up in international courts.Judging the bullying behavior of Turkey and their aggressiveness the international courts will decide.So far Turkey has been left with no friends.They have been branded by all and sundry as bullies oppressors and destabilizers- of peace in East Mediterranean.The Greeks can wait.The Turks are enemies to themselves.Wait and see.Next year comes the anniversary of the Armenian genocide.Countries internationally legalize it as we speak.Turkey cannot stop it any more.The blackmailing tactics are over.This year the French president announced it in a speech inside Turkey. I know. Turkey’s international politics are silly, selfish and arrogant. They rely on their big population, large army and booming economy (until now that the bubble has burst) to impose their own views without any agreement. They still reject Greece’s right to have its own international waters in the Aegean. Golden dawn is a nazi party and will become illegal soon.The Israeli Greeks are good people.Greece unlike Turkey does not persecute their minorities and we do not commit genocides.Democracy is born in Greece and adopted in most civilized countries apart of Turkey.But there is still hope for Turkey in the next few millenniums.